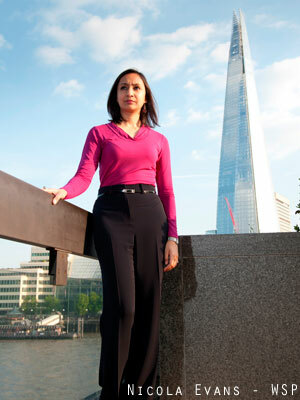 Roma Agrawal is an associate structural engineer at WSP, where she has designed bridges, skyscrapers and sculptures with signature architects over her nine year career, including six years spent working on The Shard in London, the tallest building in Western Europe. A passionate advocate supporting women entering engineering, scientific and technical careers, Roma is a founding member of the government’s ‘Your Life’ campaign and over the past three years she has spoken to over 3000 people at over 50 schools, universities and organisations across the world. 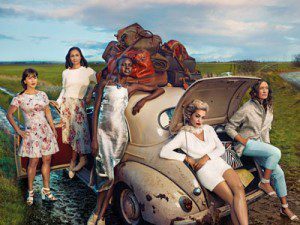 Roma sits on several panels and boards and she features in M&S’s latest ‘Leading Ladies’ campaign. Roma, please can you tell us about your career path to date? 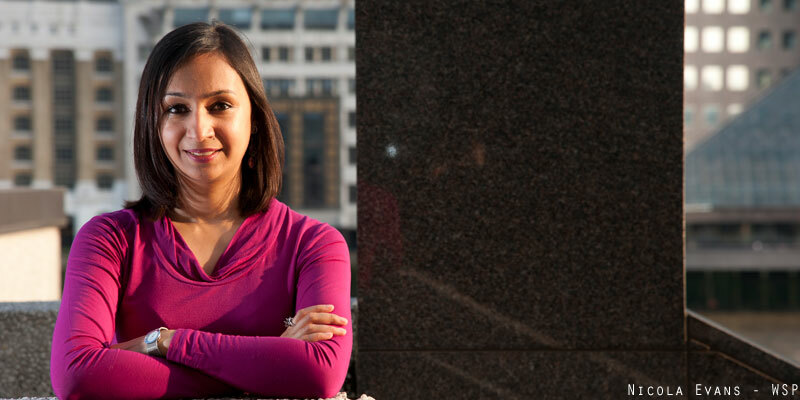 I grew up in Mumbai, India and moved to London when I was 16 to study A-levels. I attended the University of Oxford and studied physics there and later did an MSc in structural engineering at Imperial College London. I joined WSP Group nine years ago as a graduate structural engineer and am currently an associate structural engineer. You studied physics at university. What got you interested in the subject? When we were growing up, my father encouraged us to play with lego and mechano, I’m sure that played a part in giving me the practical and visual skills which help in science and engineering. I have always been interested in physics, maths and architecture and did an A-level in design and technology along with maths, further maths and physics. I didn’t know what career I wanted when I was 18, so I did some research and realised that physics would give me a wide range of skills with which I could do a number of different careers, so I applied and got in to the University of Oxford. I really enjoyed the degree, far from being technical and geeky (as stereotypes suggest) we worked on solving really interesting problems. Perception issues. Science and maths are seen as only for a ‘brainy’ few and there are outdated assumptions about what girls are good at. Lack of understanding of careers it can lead to. Science qualifications are seen by parents and pupils as only leading to narrow range of careers (‘scientist, science teacher, doctor’) and therefore not worth pursuing if not continuing in this arena. Limited knowledge of their transferability (both in terms of wider STEM careers and beyond in technology and business) and that they carry a premium in earning power. Awareness is absolutely key – we must promote an understanding of the range and breadth of things you can do with a STEM background. STEM careers are incredibly diverse and can make a positive difference to our world. You can work in marketing, design, music, sport and fashion or work to minimise dangers from earthquakes to develop life-saving medical equipment. We need to use the media to show children this diversity. Role models are also important, we must inspire young girls and give them the confidence that they can achieve anything they want, even if it sometimes feels difficult. Role models provide real life examples of women that have achieved something, and show girls that they too can achieve their aspirations. It is much more convincing if you see people that look like you succeeding in your field of interest! WSP has a schools engagement initiative called ‘Launchpad’ where we engage with dozens of students and provide them with work experience placements over the summer. This gives them the opportunity to see what engineers really do in the workplace. Please can you tell us about how you came to be involved with the government’s ‘Your Life’ campaign and the sort of work you do as part of that? The Former Education Minister Elizabeth Truss (now Environment Secretary) wrote to me asking if I would like to be part of the campaign and of course I said yes! The board’s aim is to transform the way young people think about maths and physics and the careers to which they lead. There are a number of unhelpful stereotypes around STEM (Science Technology Engineering and Maths) and we want to address these and show students how exciting and engaging these subjects are. We will be developing an advertising campaign to inform young people about the earning power and wide range of careers available to science, maths and technology graduates and the ten board members (who have all done very exciting things in their careers) will act as role models, going into schools to try and help shift perceptions of maths and science. We have over 180 corporate signatories, including WSP, who have made pledges to improve diversity in their companies among others. Much is made in the press of the challenges of being a woman in a male dominated profession. You’ve previously been shortlisted for BDO’s British Indian Awards and the Asian Women of Achievement Awards. How has being part of not one, but two minority groups affected your career, if at all? On a positive note, it makes me very memorable! If I attend a meeting and am the only woman, or only person from an ethnic minority, the other people won’t forget me because I don’t blend into the crowd. It gives me an opportunity to connect with them and build relationships, which is great. Being in a minority has also led to interest in my story. The M&S campaign is an example of how being different has had a great effect on my profile! On the other hand, it used to affect my confidence. I used to be afraid to speak up in meetings or on site, but a few years of experience has changed that. I know that if I am well prepared for meetings and know what I’m talking about, I will be listened to and respected. You’re a role model because you challenge so many stereotypes and traditional perceptions of engineering. For many years the path to success for women at work was to behave in a more ‘male’ way. How are things changing as the lines blur between what’s been traditionally perceived as ‘male’ and ‘female’? I’ve seeing a positive change during my ten years in the industry. There are more and more women working in site based roles; when I first started I was usually the only one on an entire construction site. I’m seeing more girls entering engineering, at WSP where I work, our graduate intake has been 30% female in the last couple of years. And this is completely based on merit. It’s a positive cycle, the more women you have in the workplace, the more normal it is, and the less our confidence is affected. I’d like to see these young women work their way up the ranks and stay in the industry because representation at senior levels is still quite poor overall. What do your colleagues make of all the media attention you receive? What’s the best way to manage it and ensure it has a positive effect on your career? They love it! WSP is extremely supportive of my career and my profile. Every time an opportunity comes up for me, I ask myself one question- will participating in this article / interview / documentary serve to encourage more people to join STEM careers? If the answer is yes, I do it, even if it means I’m exposing myself to situations which are outside my comfort zone. And I can confidently say that being photographed by Annie Leibovitz is outside my comfort zone! Research suggests that Millennial women are beginning to perceive gender as less of a barrier than the previous generation of women. How long do you think it will be before gender is no longer an issue in the workplace? I think we still have a way to go on gender barriers. I believe that having shared parental leave is a positive step in the right direction, but we need to make sure that men take the leave. As our leadership becomes more diverse, and both men and women take career breaks, the virtuous circle will continue and gender barriers will come off the table. There is much work being done to encourage girls at school to enter STEM careers to plug the skills gap, but it there any reason why adult women shouldn’t retrain to get into areas like structural engineering? Adult women should absolutely come in to STEM professions. They can be so rewarding, there can be flexibility in the way we work and you get paid well. Why not?! What advice would you give to women and girls who are looking to enter engineering? Say ‘yes’ to things that scare you. I knew nothing about presenting in a documentary, but I did it and I loved it. Value people. Stereotypes tell us that engineering is a very technical career, but it’s incredibly creative and about working with people. If you have great social skills you’re likely to build strong relationships and do well. Don’t fear stereotypes. They’re often wrong and may put you off something you love for no good reason. How can organisations ensure they retain female talent in the workplace and combat the brain drain when so many women leave the talent pipeline to care for children and other family members? I believe flexible working is the way forward, and will help in combating women leaving the workplace. I know a number of men who work flexibly as well, because they want to be involved in their children’s lives. Encouraging this policy will ensure that you attract and retain the best men and women for the role. I also think mentoring is important, if organisations see women that they believe are talented but may lack in confidence, mentoring can help address these issues and encourage them to consider promotions they might otherwise not. I am really enjoying my different roles – as an engineer, speaking at schools and universities and engaging with government about education. I hope to continue doing all these things. I’d also love to have more opportunities to work on documentaries to help promote the brilliant things that engineers do!